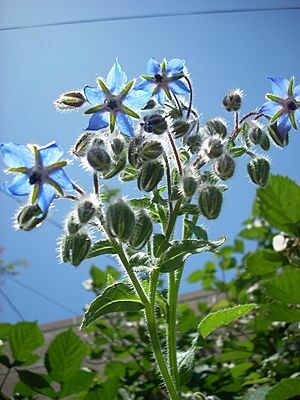 Borage, also known as starflower, is an annual herb. The flowers are perfect with five narrow, triangular-pointed petals. Flowers are most often blue in color, although pink flowers are sometimes examined. White flowered types are also grown. As a fresh vegetable, borage, with a cucumber like taste, is often used in salads or as a garnish. The flower, which has the non-toxic pyrrolizidine alkaloid thesinine, has a sweet honey-like taste and as one of the few truly blue-colored eatable things, is often used to decorate dessert. Aragonese cuisine. Borage boiled and sautéed with garlic, served with potatoes. Borage Facts for Kids. Kiddle Encyclopedia.